if you want to see less inequality of wealth, I’m with you! The tragedy comes as Mexican President Andres Manuel Lopez Obrador — known as “AMLO,” who took office in December — has vowed to eradicate fuel thieves who illegally drilled taps into pipelines an estimated 12,581 times during the first 10 months of 2018, an average of about 42 violations per day. Isaias Garcia, a farmer who witnessed the explosion from a distance, explained why so many had come to the area. “Everyone came to see if they could get a bit of gasoline for their car,” he said. “There isn’t any in the gas stations. Or when people lose their jobs, so that they cannot afford the gasoline that is available, leaving huge gluts that no one can afford. I’ve been tracking the gasoline issue in Mexico for the last few years. Gasoline has been averaging $4 a gallon since PEMEX and the government stopped providing subsidies. A couple of months after the subsidies ended gasoline thefts started. These aren’t local farmers tapping the pipelines. Thieves have included PEMEX employees, law enforcement, as well as criminal organizations. 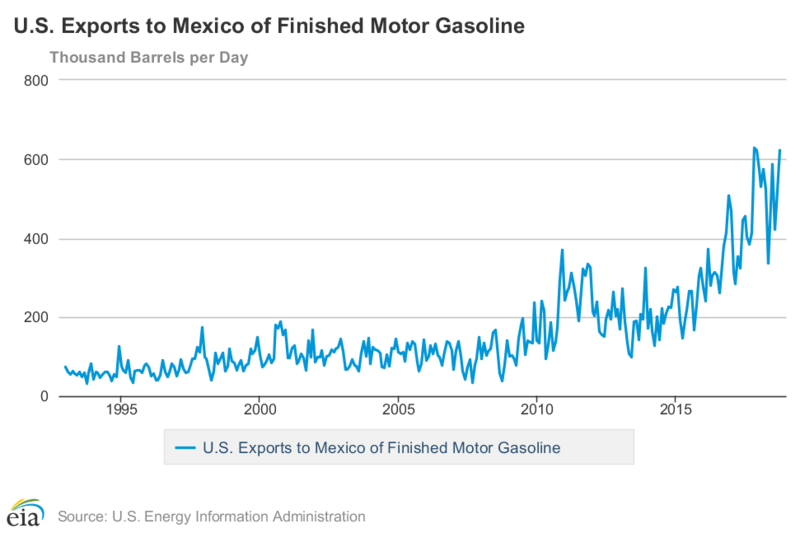 I believe gasoline shortages are creating a domino affect on Mexican exports. Mexico is the second largest trading partner for the U.S. They are the number one provider of fresh produce into the U.S. IMO a lot of the food inflation we’re seeing in the U.S. is originating from Mexico. The gasoline subsidy provided by PEMEX was also a subsidy for American food imports. For any PM investors out there, Mexico also provides 30% of the world’s silver supply. Things could get interesting over the next several years. Mexico is a major player in US finance and resources. “Mexico is the second largest trading partner for the U.S.” – Canada is no doubt number 1. We definitely get a lot of produce from Mexico. 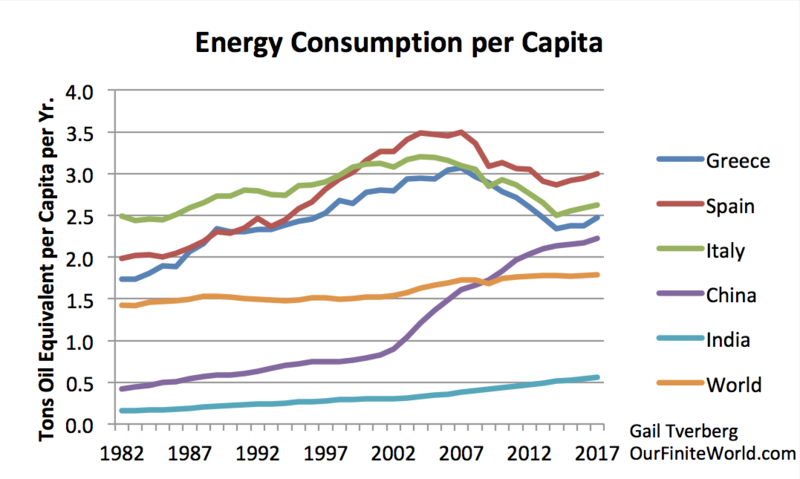 The gasoline subsidy was only possible (a) when oil prices were high, and (b) when Mexico had significant amounts of oil to export that it could tax at a high rate and then use those taxes to fund things like new refineries and programs from Mexican citizens. Recently, Mexico has been in a deficit position with respect to trade imports. (It imports more than it exports.) 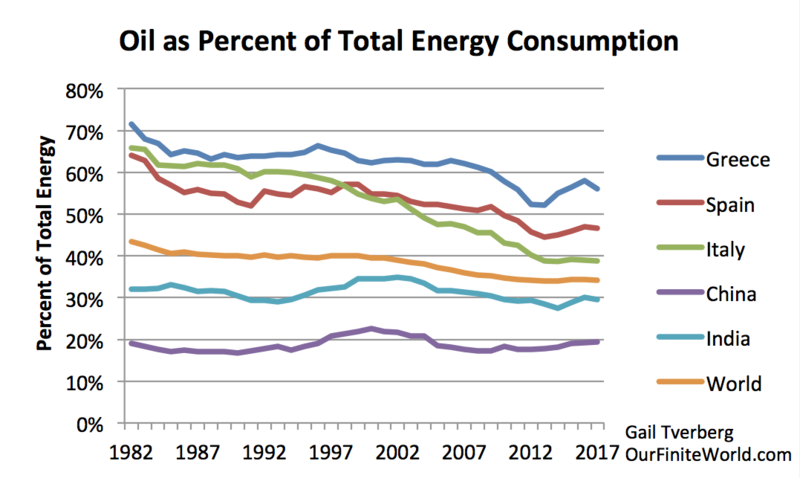 https://tradingeconomics.com/mexico/balance-of-trade It can’t really afford to purchase the refined fuel products it buys from the US, which is its problem. Gasoline imports from the US in particular have been spiking recently. Unless a country can print world currency at will, aka USA, imports can’t exceed exports for long. Any estimate for how long Mexico will ladt? So, comparing exports to imports, on a US dollar basis, the Refined Petroleum Products it buys for $18 billion exceed the value of the crude oil it sells for $15.5 billion. This sounds like a problem. Mexico also imports large amounts of the staple foods that Mexicans and their animals eat. Data indicates that their own production has grown as well. I imagine what is happening is that Mexicans are eating more meat. Also their population is growing. Both add to their total food needs, because meat production is inefficient compared to production of plant foods. I am not sure. Their petroleum industry is not now a net profit center anymore, comparing export $ to import $ (in another comment). This is a big problem. They have to support the loss with profits from other areas. This becomes harder and harder to do. Suburbia was a bad idea. increasing population. Explain to me how they can continue to have a trade imbalance for extended time. I know debt creation works, but you need lenders. When their natural resources run out who will lend them more debt? Wake me up Duncan. sorry, JHK, but Suburbia rocks! it’s been worth every penny and every drop of crude oil…. I expect that law enforcement & the military will take up any oil “surplus” as the natives will indeed be restless! The military can always “afford” what they want, after all, the government will give them all the tax money they want. The Mexican military and a lot of the law enforcement in Mexico have become less inclined to follow orders and more inclined to act as soldiers of fortunes. 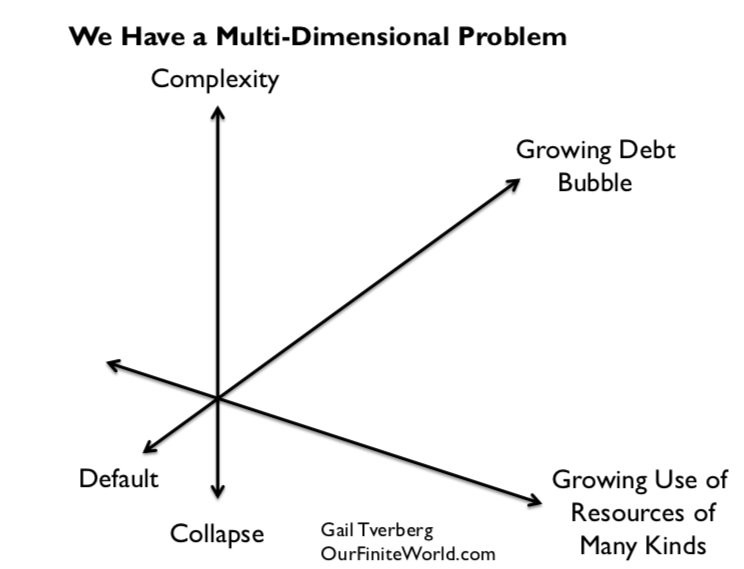 Here is an interesting article that demonstrates what is happening. Unfortunately, its wide spread. Mexico is a warmup to the main event. One really needs some real time there to make a judgement. It really isn’t that challenging. I think they are following the money, their not getting paid enough by the Mexican government, the drug gangs offered them a better & safer deal so they took it. Any unpopular government that wants to stay in power had better pay it’s law enforcement & it’s military very well or they will seek a better option. The same thing happens here but it isn’t as widespread as in poorer Mexico since their oil revenue went south along with their oil. As things continue to deteriorate, we can expect even more migrants trying to get past our borders for “a better life” but is “life” on our cold, cruel streets really better than where they are now? Those migrants fleeing central america look better dressed, better fed & they even have smart phones, something our poor, needy, jobless & homeless do not have. Perhaps our poor, needy, jobless & homeless should migrate south for a “better life”. Trump claimed he could identify with those workers missing paychecks! Hardly, he got his start as a landlord evicting tenants! The Russians kinda help him, but he has burned so many people, that no one will touch him. He lost 400 million that Daddy gave him. He was, from what I hear, not a bad TV personality. A good reason to give the orange man his wall money…Willing to bet the shut down will cost more that the wall. The crisis was precipitated on Sunday (January 13) by President Emmerson Mnangagwa when he announced a shock increase of 200 percent in the fuel price – this in a country with more than 90 percent unemployment and where the struggle to survive escalates daily. It sounds like a big problem. I forgot to mention that the Zimbabwe Gov’t shutdown the internet i.e. “killswitch”. One day in the not too distant future we could be seeing reports of this from around the world. But the masses don’t care because their respective Govt’s have their attention turned towards sports and entertainment…. It’s not so much about distractions, people just don’t enjoy staring death and destruction in the eye. Better to deny it, make some rationalizations, or just think about nicer things. Looks like poor wages has spurred people to stealing fuel/oil to make some money to live on. More unfortunate consequences on the way down. The fundamentals of the retail business look horrible: Sales are stagnating, and profitability is getting worse with every passing quarter. Are retail sales, in total, down that much, or did retailers build too many stores? I guarantee you that if Sears closed half of their lower performing stores, and were able to write off their debt, they could still be profitable. The remaining employees and executives would have to take large pay cuts, as well as shareholders, but they could make money. Just like shale, if they limited their number to just the most productive platforms could make a profit. It is the debt repayment that kills. This is the step down that Archdruid thinks will happen. It is all up to banks and people to write off bad debt. Like monkey with hand in log, have to let go of something to survive.Greed kills. I don’t necessarily buy the over built stores argument..And the reason is the US population is still growing around a few million or so every year..So its hard to argue you have to many stores when you are adding more and more people every year..I’m sure though in some places where the population is shrinking, that could be the case..But overall in general that doesn’t seem to make much sense..And due to all the box and chain stores they have consolidated nearly all of the small business stores..So you would think that there are less stores today than in the past before you had all the wal marts etc.. I think the US economy is suffering from “stagflation” right now..
From this I would deduce that the census department believes that immigration lead to an increase in US population of 978,826 in the 12 months ended July 1, 2018. The excess of US births over US deaths only added 62,661 people (1,041,487- 978,826). Of course, immigrants have higher birth rates than others. Cutting back on immigrants would make the excess of births over deaths negative. EDIT: I did this	wrong. See discussion below. Total is really about 2 million. Oops! 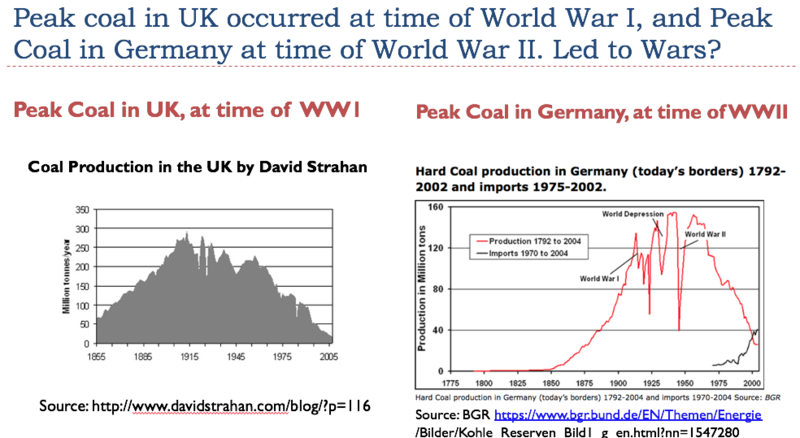 Natural increase is birth – deaths which is 1 million. Immigration is another million. So population increased by 2 million. Total population growth was 0.6%, (down from 0.7%), so I am reading this wrong. If total population was about 326 million in 2017, then 0.6% is about 2 million. 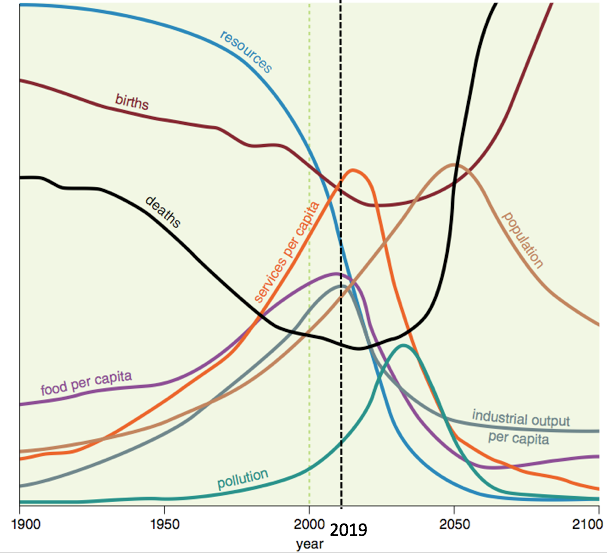 It strikes me that population growth is less relevant for the sale of consumer goods – you could add millions of people to any economy, but if they don’t have any money and/or have shrinking wages, then I can’t imagine they’ll be buying much. 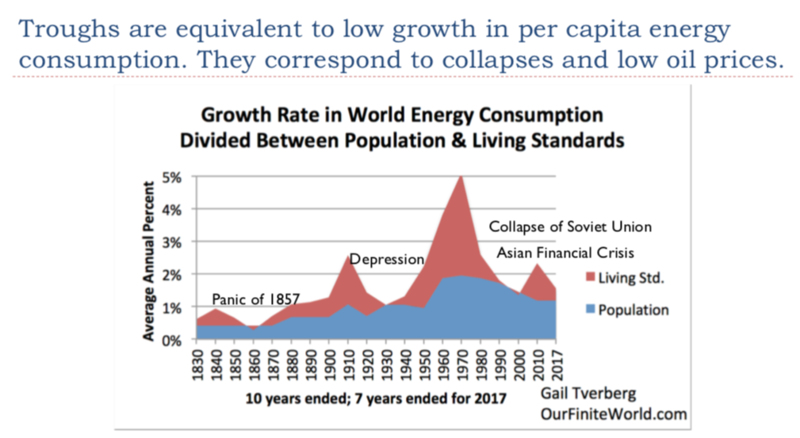 Perhaps this is just how many have suggested a deflationary wave plays out: assets collapse in price as nobody can afford them, while basic necessities continue to increase in price (driven by increased demand by population growth at the same time that cost of production increases)? The problem is that the low-performing stores are in the rural, depressed areas with few jobs. Closing these stores makes the situation worse. The stores in the cities would mostly stay, except for those in economically depressed areas. The rich grow richer; the poor get poorer. move the tray slightly, and the oildrops begin to move. A quick search of retail sales shows that for the last ten years, most months have shown an increase in retail sales. 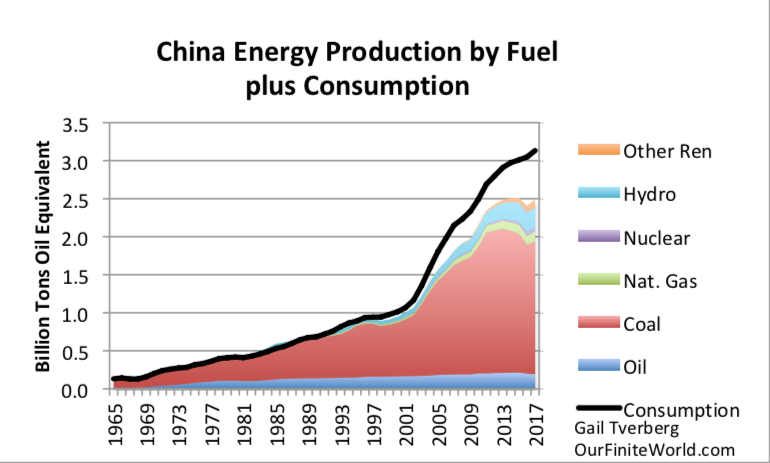 The last ten years have also shown an increase in energy production. They go hand in hand, which is what Gail has been saying. When energy production drops, economy will follow, but her point is that Banks and lenders expect you to pay back plus interest, which is getting close to being not possible. Will they realize that hey, we need to reset terms of loan to be more realistic, or say screw you, if you can’t pay we will liquidize you, because, you know, Tony needs his money. It’s like legal mafia. Iron fist in velvet glove. But it won’t work when everybody is shrinking. It’s simple punishment mentality. Will prisons still be growing while energy shrinks? I would like to think that the new push for feminine leadership and qualities in the media will lead to more group support and caring, but what I see is aggressive, bullying feminism. Some weird mutation between all competitive masculinity with a feminist skin. A bit of a rant, thanks for letting me blow off some steam. I agree. 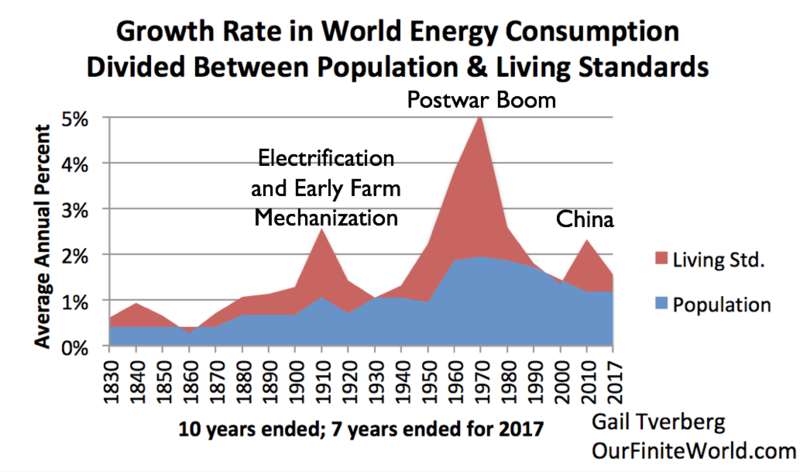 Increased energy consumption underlies all growth in what we think of as GDP. There has to be a high enough return on investment for the system to work, though, and that is becoming less and less possible because of diminishing returns. So the system starts reaches a point where the amount of interest it can pay is very low, and the frequency of defaults is much higher. Any little upward adjustment in the interest rates causes a major problem. Not too bad, would have guessed poorer half didn’t own anything. A million mud-houses here, a billion second hand garments there, it adds up. After a minor asset price crash we’ll have 250M western debt slaves with negative net worth and a calculation like this impossible.